It might be cool to make a latex mold of the original, and use that to make a reproduction in resin. I'm pretty sure there isn't one, unless it was overlain by the pyramid or stolen. I take photos of them when I see them, but don't have one for that peak. My summit pano doesn't show one and it covers most of the high ground. In reference to your question, benchmarks don't really look like that. It's "monopoly money", somewhat close, but not realistic. 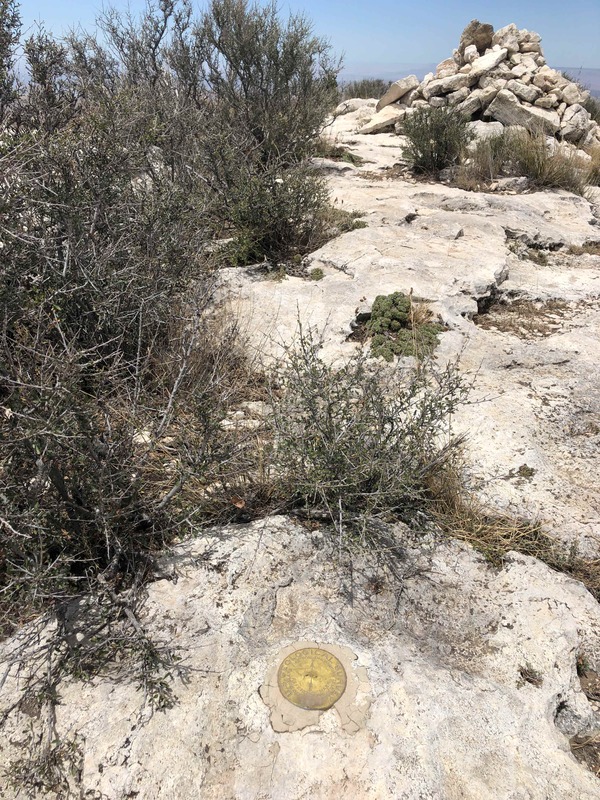 The summitpost.org website (see link) has no photo for Guadalupe Peak bench mark in their gallery of state high point markers, which (to them) means either there is no marker, or no one has posted a photo of it. As for there being no marker, the USGS topo map shows a triangular symbol with elevation at Guadalupe Peak, which indicates a benchmark. The same symbol appears at Hunter Peak (Pine Top), and I have a photo of that bench mark. So nix the idea that there was never a bench mark placed at the summit of Guadalupe Peak. The pyramid was placed by American Airlines in 1958, with the US Postal Service and the Boy Scouts. I think it highly unlikely, though not impossible, that these folks would have placed their monument over a USGS bench mark. That leaves the most likely answer that the marker was stolen at some point. I vaguely recall seeing the mark in the late 1990s, when I wandered around the summit area, but I could be mistaken. My recollection is that it was located about 100 feet or so north-northwest of the pyramid. This web page describes the mark atop the peak. It was reported in good condition in 1972, which is after the placement of the pyramid. If you scroll down all the way to the bottom, you'll see the last note is "MARK NOT FOUND" in 2010. It was likely stolen. Interesting researching these monuments on the National Geodetic Survey (NGS) site. CD0990 Hunter Peak (PINE TOP). I have a photo of this one. CD0991 Pine Mountain (PINE). This peak is not named on the maps. CD0992 Wilderness Ridge (MC KITTRICK). Note the space in "McKittrick". CD0993 Frijole Peak (FRIJOLE). Peak is not named on the maps. CD0994 Guadalupe Peak (EL CAPITAN). Unfortunate choice of name for the station. CD0989 (?) Lost Peak (PEAK 1 ?). The maps show a station here, but NGS says no descriptive text available. Seems fitting for Lost Peak. PINE, MC KITTRICK, and FRIJOLE as furthest off the beaten track. It would take a dedicated enthusiast to visit these. Those aren't too difficult, really, unless you're only in it for the marker. If you're already up by Hunter, Frijole can be reached by traversing the ridge-line, and McKittrick is near the Permian Reef trail. I would say Pine isn't too far from the McKittrick Ridge Trail, but would require the most effort. Oddly enough I've been within 700 ft. of it but had no reason to visit that "peak". Not planning on going back, but Frijole is on my to-do list for this year, and McKittrick will be at some point. There should be another one on Cutoff Mountain (far NW corner), which I will hopefully visit this month. I figured out something about the National Geodetic Survey (NGS) station name "Peak 1", Permanent ID = CD0989. I thought this was the bench mark atop Lost Peak, near the Dog Canyon side of the park. There is no detail information on the NGS website about this mark other than the Pid (CD0989), the name (Peak 1), and the latitude and longitude. (N 31 54 27, W 104 52 28). It turns out these coordinates put you right on top of Shumard Peak! The coordinates for Lost Peak are N 31 58 11, W 104 51 17. So although maps do not indicate a bench mark on Shumard, there is a minimal entry for it on the NGS website. On the other hand, maps do show a bench mark on Lost Peak, and there is evidence that the mark has been observed and photographed, but there is no trace of it on the NGS website. It would be nice if someone could submit an update to the NGS website for the Lost Peak bench mark, to get a data sheet established for it. Yes AG, thanks a million for the trip report. Desperation had forced me into re-reading old trip reports. So it appears one of your photos includes the bench mark at Lost Peak? This benchmark is indicated on maps, but not on the NGSDataExplorer interactive map. It would be nice if someone could submit this bench mark to the NGS so they could set up a data sheet for it. Did you take a close-up picture of the bench mark? Right, thanks. I was (incorrectly) using the term "bench mark" in the broadest sense. The correct term according to NGS is "survey mark" or "station". It isn't a bench mark unless it the elevation has been confirmed. Terminology seems a little confusing, as are map symbols. Typically a small triangle on a topo map indicates a triangulation station, which means a bronze disk, permanently mounted, with a known latitude and longitude. Topo maps seem to be more a function of USGS rather than NGS, which are different agencies. So your photo shows a "U.S. Geological Survey" monument on Lost Peak, whereas the one on Hunter Peak reads "U.S. Coast & Geodetic Survey Triangulation Station". Maybe that's why the Lost Peak monument is not in the NGS system, because it was placed by the Geological survey rather than the Geodetic?. I don't think it matters which survey. This marker just points you to the Benchmark, regardless of whether it is a triangulation mark or standard benchmark. Odd that it isn't listed at the website Flash posted. The actual marker could be under the edge of that unnecessary cairn. I see now, the mark plainly states "Reference Mark", and the arrow gives the direction to the actual Survey Mark. As for the mysterious "Peak 1" (CD0989), whose coordinates coincide with Shumard Peak, the data sheet reports Code D: "No descriptive text available" and Code N: "No geodetic control".